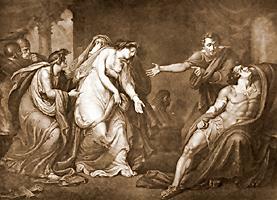 ANTONY, CLEOPATRA, EROS, CHARMIAN, IRAS, &c.
Ant. O, whither hast thou led me, Egypt? By looking back on what I have left behind 'Stroy'd in dishonour. Painted by Henry Tresham, R. A. Engraved by George Sigmund and John Gottlieb Facius.